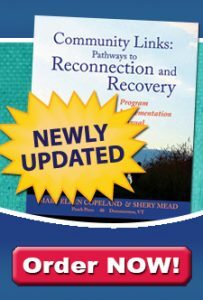 When you think about your recovery journey, what comes to mind? WRAP, wellness tools, your support system perhaps. What about personal responsibility? You could have the best support structure, WRAP and peer support – it won’t truly help your recovery until you decide what changes need to happen in your life and you take steps to make them happen. There’s a reason Personal Responsibility is one of the key concepts to recovery; it involves taking action and doing what needs to be done to get well and stay well. I’ve included personal responsibility prominently in the WRAP resources we have available on the website and also in my books.